Description: Christians have sometimes professed that the church ought to be ""in the world but not of it,"" yet the meaning and significance of this conviction has continued to challenge and confound. In the context of persecution, Christians in the ancient world tended to distance themselves from the social and civic mainstream, while in the medieval and early modern periods, the church and secular authorities often worked in close relationship, sharing the role of shaping society. In a post-Christendom era, this latter arrangement has been heavily critiqued and largely dismantled, but there is no consensus in Christian thought as to what the alternative should be. The present collection of essays offers new perspectives on this subject matter, drawing on sometimes widely disparate interlocutors, ancient and modern, biblical and ""secular."" Readers will find these essays challenging and thought-provoking. Endorsements: ""'Let the Church be the Church ' In early ecumenical debates, this was a guiding principle. Churches tried to define a new, critical role in society, after having failed to speak up for victims of violence and injustice. Descendents of the Radical Reformation--represented in this volume--confront us with that challenge anew. In dialogue with philosophy, history, sociology, and even the arts, a political theology for an exilic church (or exile-church) is inspired. This holds the potential to make a real difference--and renew the church's self-understanding."" 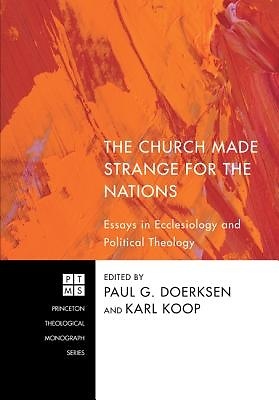 --Fernando Enns The Vrije Universiteit Amsterdam About the Contributor(s): Paul G. Doerksen is assistant professor of theology at Canadian Mennonite University. He is the author of Beyond Suspicion: Post-Christendom Protestant Political Theology in John Howard Yoder and Oliver O'Donovan (Wipf & Stock, 2010). Karl Koop is professor of history and theology at Canadian Mennonite University. He recently published Confessions of Faith in the Anabaptist Tradition, 1527-1660 (2006).